Metta Spencer intended only to hold a forum that would produce a “Platform for Survival” to link together the campaigns that aim to prevent six global threats. Then she would retire. But now the work on “Project Save the World” may be just beginning. I never expected to be mistaken for Moses. Maybe I shouldn’t have offered to save the world. Moses himself only offered to lead his own people to another land, and he had to be pushed into doing that. However, he did come down from the mountain bearing tablets of stone with commandments from God, whereas I could only produce a “Platform for Survival,” dictated not by the Almighty but by a two-day meeting of ordinary people. The Platform is no revelation—just a pretty good to-do list. And I am no Moses—just an old lady with a slightly failing memory and no charisma at all. Sorry if I’ve misled you. But around the world, thousands of other NGOs are doing their best to save the world from catastrophes, six of which might conceivably kill a billion people. And all of those global threats are interdependent, so it would make sense for those workers to combine their demands and share one single common agenda to save the world. Last September I decided to take on that task as my final organizing project before retiring from peace activism. I’d contact NGOs and professionals who are combatting six global threats and get them to list their top policies as a concise Platform for Survival. After that I’d just go home and write a book. The NGOs would own the Platform and decide for themselves how to use it. The application of it would not concern me, for I’d be used up after my final splurge of energy. Little did I know what I was starting. Whether or not the Platform for Survival eventually helps to save the world, it has already generated considerable enthusiasm—and also conflict. You, my friends, keep telling me that the forum was a triumph and the initial phase of something even bigger, which you’re ready to join as soon as I tell you what to do. I haven’t figured out a game plan, but no NGOs and professionals are taking the Platform over from me, nor is anyone else offering either. And so you expect me to keep going? Get real, guys! Moses lived to be 120. I will not. I can hardly walk anymore, and besides, I can’t organize a social movement. You do it. No? You won’t? Oh, hell. Campaigns are hard and expensive, and not my forte. I’m done with Science for Peace, so my base is now Peace Magazine. I can’t run around town anymore. I just want to write a book. I have no vision of the promised land and I can’t save the world. Oh, all right. Let’s get back to work. First we’ll thank each other, because we already have done something unusual and potentially even useful. I thank you. Second, let’s review what has worked well so far, and especially what has not. No event ever comes off perfectly and we are marching toward a radiant future with a little egg on our faces. But humility is a good thing when we can still congratulate each other warmly anyway—as indeed we can. So thank you, everybody. We were fabulous in the forum, and in four ways we fell short. A few of those shortcomings can still be repaired with some hindsight reviews and second-guessing. This article will reflect on how our successful platform could have been even better, and how we can still improve its effectiveness, despite no longer being free to amend it. First Hindsight Insight: Five of the Six Threats Were Under-represented. I could not recruit many people working on the five global threats other than peace. That’s a big shortcoming, since it was one of the two main goals of the project. The other goal was to bring together an audience and speakers who could give us good advice. The speakers showed up and gave masterful lectures, and the audience was wonderful too, but they were almost all peaceniks. We still have to enroll a truly inter-disciplinary group of partners before we can wage a campaign against all six threats. I’m going to concentrate now on bringing in more top leaders from the other five threats. Here’s a tip: It’s harder to recruit NGO leaders than academics, professionals, or officials in government-run agencies. The NGOs are already stretched too thin, but if you call a scientist she may even answer the phone herself and get excited about your pitch. So we may not recruit many NGOs until we have some big names. They will attract the NGOs for us. Think of all the high-profile people you’re too shy to call. They are probably your best bet. Second Hindsight Insight: The Forum Was Run Mostly from the Top, Not the Bottom. We need participatory democracy—some new way of combining grassroots activism with scientific expertise. I had a plan for doing that. I’d (a) collect public policy proposals from everyday people, who would then (b) listen to the advice of experts, then © discuss their ideas in small groups, and (d) pick the best proposals from the whole list, (e) to form a short one-page set of demands which, like a political party’s platform, could (f) attract support from the most inclusive population. Everyone would have to think hard. Normally when we combine experts and “laymen”, we don’t expect them to work together as equals. If we do so, the specialists’ level of discourse has to be “watered down” to make it intelligible to non-experts. Nevertheless, in a democracy the majority is supposed to rule, so all sorts of citizens need to be well-informed. Experts have a duty to share their knowledge with everyday lay people. Science for Peace used to combine all members—academics and Everydays—on an equal footing, but by now most of the experts have left, leaving all the peace education and peace research work for the others to do. But the Everydays know enough to know that they don’t know enough, so they wisely decline the honor by pretending to have no free time. I hoped to avoid such negative results in the “How to Save the World in a Hurry” forum. So in my plan for participatory democracy, I would ask experts to inform the Everydays, which should improve the quality of their political demands. Fortun­ately, when I contacted professionals and asked them to advise us, they almost always gladly obliged. I asked them to impart their knowledge to the forum during Q and A sessions with the Everydays, but in fact most of the experts spent too much time lecturing. Nevertheless, their talks were invariably superb, so the audience felt well-served and appreciated the excellent quality of the forum’s first day. Anyway, I expected the balance between experts and audience to be reversed on the second day, when the breakout groups would consist mainly of Everydays, chaired by an NGO and with a resource person. Those two “officials” would just keep the discussion orderly and insert factual tidbits when information seemed lacking. I should have known what to expect. I didn’t emphasize a chair’s duty to be impartial. As a result, in some breakout groups opinions were polarized and discussions turned fierce. Every morning in my email now, I receive another complaint about the anger expressed during those meetings—both by and against the chair. If the first day, full of lectures, enthralled the audience, the second day, full of discussions, did not. Nevertheless, it did yield a Platform for Survival, adopted by consensus in a plenary session astutely chaired by the journalist Doug Saunders. That fulfilled our main objective beautifully, and we are still celebrating it. But did the anger, so evident in certain breakout groups, impair the quality of the whole final Platform? Opinions differ. I sent the document to friends abroad, who called it “good, but conservative.” As Doug Saunders predicted, none of us like every detail, but we all accept the whole document anyway. Probably not everyone will sign it, but no one (including me) can legitimately change it except later in a review conference, if one is ever convened. The Third Hindsight Insight: The Platform is an Uneven Document. The 25 items were written by different people with very different assumptions about the audience and whether our Platform should be realistic or visionary. Certain minor syntactic inconsistencies were easily eliminated by editing, but—of course!—the larger ones needed substantive editing, which would ignite the conflicts that we had averted. We chose to keep the poor writing rather than jeopardize our vaunted consensus. About half of the planks on our proposed Platform were demands for specific policies and half were vague declarations of benign intent. It is easier to write general than specific demands, especially when you are limited to 15 words per proposal, which was our rule. The unevenness is most noticeable when we compare proposals about War and Weapons, Pandemics, and Cyberattacks to the other four sets of proposals. The former are real statements of policy; anyone can tell with certainty what has to be done to fulfill each one. But on the other hand, the proposals about Global Warming, Famine, Radiation Exposure, or Enabling Measures are so general that anyone in the world could give lip service to them while practicing the exact opposite. I realize that retrospective critiques seem especially snarky if they come from the very author of the frustrating 15-word limit on each proposal. I acknowledge the irony. Still, hindsight replays are the only means of learning from our own mistakes, and I have much to learn, so please forgive my graceless reflections on Platform proposals that I actually admire. Take: “All states shall incorporate environmental considerations in developing national dietary food guides.” That sounds good—but oh dear, what have I actually signed onto? Is the plank’s real purpose to get us to become vegans? Or does it mean we should all eat more meat so that herds of animals will roam around reversing desertification? Does it mean we should not eat almonds because the orchards require too much water? In any case, nobody consults a food guide when deciding what to eat, so this proposal won’t affect global warming much anyway, but recommending a single specific policy might have been more effective. Or take: “Social movements and states shall prioritize Sustainable Common Security to address shared global challenges.” That sounds like a Hallmark greeting card, not a bill in parliament. I am totally in favor of “Sustainable Common Security.” I think I know what it means but most other people don’t. That weakens it for our Platform. It’s a wise set of principles but it could never become a law. Fortunately, the online version has a footnote. If you click on the footnote number, the definition pops up, giving some examples. However, on a single page of paper these 25 policies cannot have footnotes. Compare the plank about Sustainable Common Security to the precision of this one: “All states, including those in NATO, shall sign, ratify, and within 10 years comply with the TPNW.” That one is clear. You can organize a real campaign demanding that. In fact, we have one now. As negotiations went on in the breakout groups, there was a tendency to compromise by fuzzing up clear demands for specific actions so they became “motherhood issues.” I fully endorse motherhood, as well as all the Platform proposals. My only concern is that we must campaign seriously to promote them, so first we must spend several months writing appendices that make explicit the demands that each one now only implies. We need working groups to write a page or two (or maybe a whole book) for each plank, explaining how to know objectively when it is fulfilled. Such explanations won’t be attached as footnotes to the original text (nobody can alter the text until the review conference) but we can put them in on the web site so everyone signing the Platform can know what they are really endorsing. The Fourth Hindsight Insight: The Platform is Too Conservative. Origin­ally I had envisioned each of the 25 policies as a finger pointing accusingly at a specific global organization that is betraying its mandate to save the world from something. I’ll illustrate with a proposal for the Platform that I submitted myself: “All national armed forces shall be reduced by at least 80%, including equipment emitting CO2.” It’s a bold demand but I could easily justify it by pointing out the links between militarism and all our other global threats: global warming; famine; pandemics; massive radiation exposure; and cyberattacks. If one of them occurs, it is likely to trigger one or more of the others, which will multiply the horrible outcome, but no one has calculated the magnitude of such joint effects. But that’s only one of militarism’s effects. Both war and global warming can create famines. Today famines never occur except as acts of war, perpetrated deliberately to kill enemies.3 Yet climate change creates scarcities, which make famine into a cheap, convenient weapon. Thus militarism not only enables global warming but also famine. And that’s not all. Pandemics have historically gone with famine4 and war; now they also go with global warming. Past pandemics were transmitted by warfare; the Spanish flu, spread by soldiers, killed between 20 and 50 million persons—more than killed by World War I.5 Moreover, famine (or even malnutrition) impairs the immune system, making people more vulnerable to contagious disease.6 And climate change is spreading insects and animals into formerly temperate areas, where they bring such new viruses as Zika and West Nile. So militarism enables global warming, which enables famine and also pandemics. And we can add radiation exposure to the list of militarism’s effects. Nuclear power and nuclear weapons go together. The first reactors were built to produce weapons-grade plutonium, not electricity.7 All nuclear reactors produce plutonium and other ingredients for “dirty bombs.” Reactors are also perfect targets for attackers. Only five percent of Fukushima’s radioactivity was released by the tsunami, yet the consequences are devastating. If a bomb struck, the whole amount might be released. QED. Reducing the military might directly _reduce, not only the probability of war, but also of global warming, famine, pandemics, reactor explosions, and cyberattacks. _Indirectly, it would reduce those threats even more by enabling the world’s vast military expenditures to be redirected toward other ways of preventing all horrible disasters. For these reasons, eliminating militarism may be the single most effective way of saving the world from all six threats. It may in fact be essential. Nevertheless, when I proposed that all nations reduce their militaries by 80 percent or more, the most distinguished peace activist in the room objected. He said that it was unrealistic. No country would reduce its military so much. If you propose such a radical idea, you just doom the Platform, for the people in power will not take it seriously. Ah yes—realism. We hadn’t worked out in advance how realistic the Platform should be. We probably even had different audiences in mind for the proposals we were assembling. Were we creating a petition or a manifesto? Were we hoping to change the minds of generals in the Pentagon? Or were we planning for a whole new world order? I had called for a project to save the world in a hurry, but in fact I had bigger and longer-term goals in mind then Doug Roche. But out of respect for him, I proposed a compromise. “Then how about just fifty percent?” I asked, though I knew what he would say. I argued that countries could actually eliminate their armies entirely if there existed a credible UN Emergency Peace Service instantly ready to protect any nation from any attack. Yes, the UNEPS would have to be created along with demilitarization. Lots of changes would have to be made simultaneously, but sometimes two or three hard things can be done together that could not be done separately at all. In fact, we probably will have to handle all six threats together. The opportunity will arise only with some kind of crisis—a real shock to the world’s existing system. Some shocks are completely unexpected (think of 1989 when Communism fell) but we need to have the visionary new plan ready for that moment. Otherwise a reactionary movement may be quicker and we will lose again. Such a visionary plan is not today “realistic.” The Platform for Survival that we created is neither fully one nor the other. It is too realistic today to be useful after the crisis. Still, we can start with its small, realistic proposals, which are certainly better than nothing. And as we work, we can entertain bolder ideas. Of course, my plan for reducing the military drastically did not prevail. The final Platform just encourages nations to “reduce their militaries” without specifying by how much or how it will help. Conservatism also won the negotiations of the other planks. Yet there is this advantage: Conservative proposals are acceptable to more people and so may gain more signatures than visionary ones. Probably I should be happy about this trend—and I guess I am. But I’m also proposing an alternative strategy to counter the Platform’s deficiency of both clarity and boldness. On one hand, let’s promote this mild document, this nice, sensible “Platform for Survival,” which I love and many people will endorse. Who would oppose a call for “justice,” or “human rights,” or “stringent efficiency standards”? Nobody! And most people won’t object to reducing armies, as long as we don’t specify how much. But meanwhile in the back room we’ll have teams of specialists and activists writing appendices and even a book clarifying these vague proposals to match our longer-term goals. They will specify details and cite numbers— percentages and rates and costs per tonne—as well as references to treaties and legal precedents and IPCC reports. These appendices will be bold. They may even include my cherished “80% military reductions” proposal. 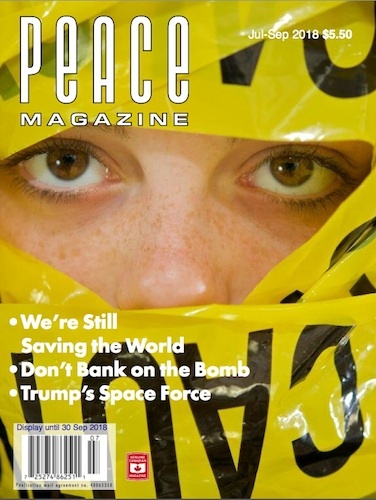 a) I’ll continue publishing Peace Maga­zine — which will cover the six global threats more. Soon we may need another editor or two. Tell me if you are interested. 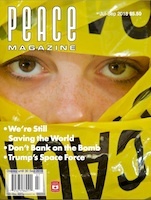 b) I’ll keep producing the weekly discussionshow on Peace Mag­azine’s own Facebook page. Each week I chat with a panel about a topic related to the Platform for Sur­vival. Go to Facebook and watch us on Peace Magazine’s page from 8:00 to 9:00 pm EDT every Monday. If you miss the live broadcast, you can watch it later there or on Peace Magazine’s website. c) I’ll hold a “Meet-up” every month to talk about the Platform issues. If you’re in Toronto, please join us every fourth Tuesday at 7:00 pm at the Sky Dragon Chinese Restaurant at Spadina and Dundas. Dinner costs about $40. We’ll talk about, or even study, the six global threats and the governance and financial reforms that can help make solutions attainable. d) I’ll contact professionals and experts to set up meetings to explore the connections among the six global threats and their joint responses. And what will you do to save the world? You can either join the “backroom team of big thinkers” or work on promulgating the Platform for Sur­vival in your community or in the wider world. If you choose the latter, I suggest that you meet groups of senior citizens in retirement homes? They have more free time than young people and they still want to be useful. Stay in touch with us on the website tosavetheworld.ca or on Twitter, tosaveworld2018. Join in our occasional Zoom conference calls. Watch our talk show on peacemagazine.org. Read Peace Magazine, and talk to lots of strangers about what you learn. We have a world to save. Yes! Our next forty years in the desert will be fun. See you there! 1 Estimates vary markedly as to the strength of democracy. Freedom House reported that in 2017, for the twelfth consecutive year, freedom declined around the world. Since 2006, 113 countries have seen a net decline, and only 62 have experienced a net improvement. On the other hand, according to Matilda Jimenez, as of 2016 some percent of the world’s countries, home to 62.2 percent of the world population, were choosing their governments with genuinely contested elections—which is an increase from 62 percent in 2006. See Matilda Jiménez, “Is Democracy in a Worldwide Decline? Nope. Here’s our data.” The Washington Post, Nov. 15, 2017. Overall, it seems that most political observers accept Freedom House’s conclusions. 3 Alex De Waal, Mass Starvation: The History and Future of Famine. London: Polity Press, 2018, and Rhoda E. Howard Hassmann, State Food Crimes. (Cambridge, UK, Cambridge University Press, 2016). dx.doi.org/10.1080/00396338.2011.555586. The documentary film Zero Days reveals the history of this malware, and its implications for the Iran nuclear deal.